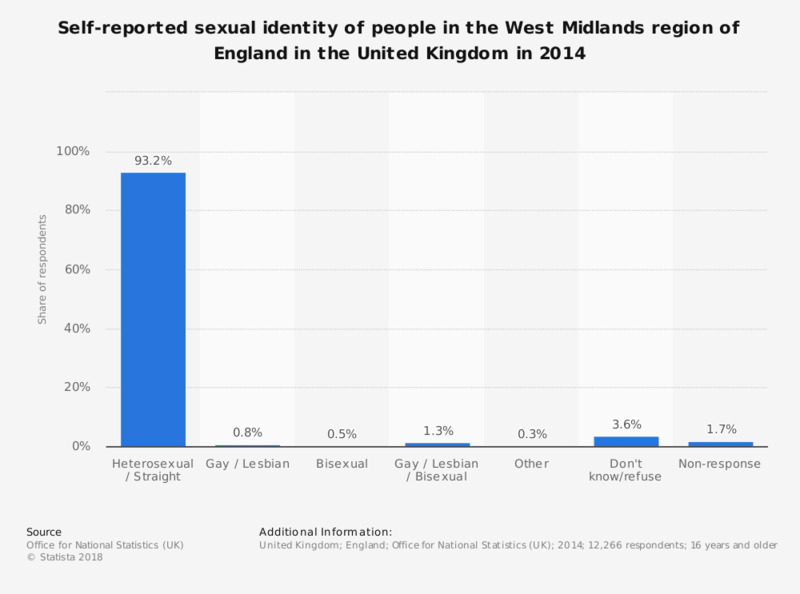 This statistic shows the self-reported sexual identity of people in the United Kingdom in 2014, in the West Midlands region of England . The majority of people in the UK identified themselves as being heterosexual with roughly 1 in 100 people identifying as being gay/lesbian or bisexual. ONS defines 'no response' as no data provided to the question by an eligible responder. Face-to-face and telephone interviews were used. During the face to face interviews, respondents were asked; ‘Which of the options on this card best describes how you think of yourself?’ For telephone interviews, the interview said ‘I will now read out a list of terms that people use to describe how they think of themselves’. The list was read out to the respondents twice. On the second reading, the respondent had to say ‘stop’ when an appropriate term they identified with was read out. In both modes, the order in which the terms appeared or were read out was unique for each respondent to ensure confidentiality. Do you think your work efficiency would improve if you did not feel any need to hide your sexual orientation? From what you know, which group has the highest number of unplanned pregnancies in the United States? If you were sure you did not want any more children, would you be willing to have a procedure for definitive contraception? What percentage of people do you think would say they personally believe that homosexuality is morally unacceptable? Does any of the following happen to you due to LGBT discrimination at your workplace?